Next generation of convenient, dependable and easy-to-use personal lightning detector! 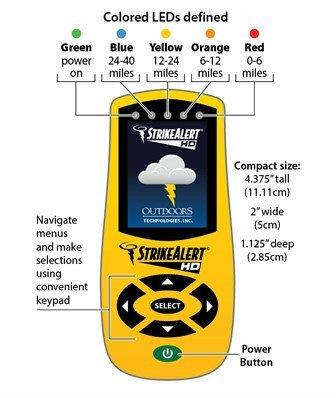 Built on the trusted KKIStrikeAlert technology, StrikeAlert HD is the first personal lightning detector with a graphical display that shows you the lightning strike distance (form 0 - 40 miles away) as well as a 1-hour storm trend and intensity. 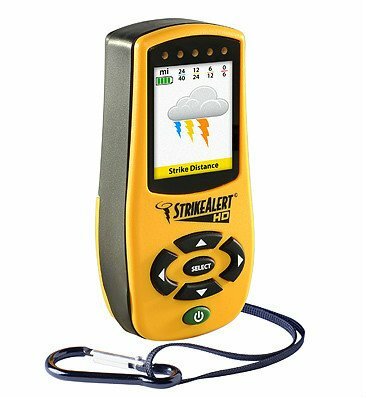 Most other personal lightning detectors offer only 180° tracking, but StrikeAlert HD offers complete 360° tracking - in all directions, so there are no blind spots. You can set the unit to alert you to danger with both an audible and vibrate warning. StrikeAlert HD achieves up to 80 hours of operation from two AA batteries. Lightning is the number one cause of weather related deaths – so play it safe outdoors! Whether you’re on the golf course, hiking or biking, or the kids are on the soccer field, use StrikeAlert to give early warning of the storm. Take lightning safety into your own hands. StrikeAlert HD tracks lightning in ALL directions - there are no blind spots.